First I tried my homemade gelli plate. Just an FYI, I made this plate with gelatin, water and rubbing alcohol and I’m going on a year with it, with no refrigeration required. It’s amazingly sturdy and cleanable. 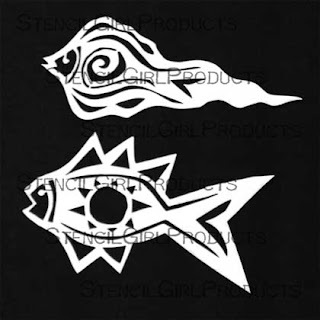 I used all of the stencils and also the masks, which are a super feature of this stencil set. Really, as you’ll see further along, it’s like getting two sets for the price of one. You can tell from the photos that I went a little wild. But the more you make, the more you can do. 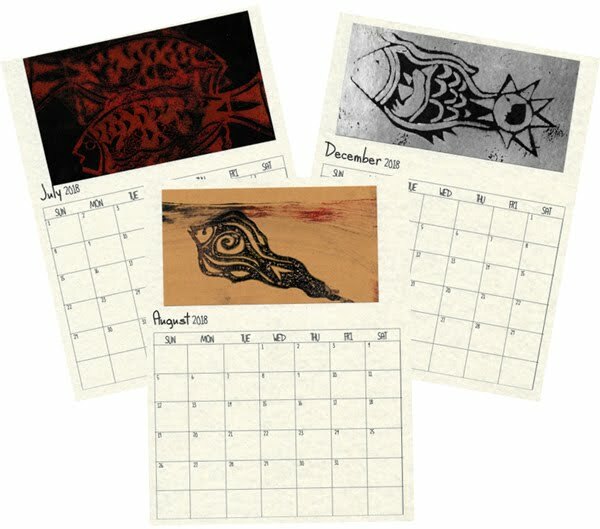 I turned 12 of the prints into a calendar, which is my current favorite giveaway for friends. You can find calendar PDF files online. I print out the calendar on nice card stock, vellum in this case, and then crop my prints and apply them with a glue stick, which is probably one of the best inventions ever. I also did some printing on old dictionary pages– another current love. Those were glued to folded art paper, so I can use them as notecards. I’m finding people really love the thought behind a note that’s actually mailed the old fashioned way! Now, on to fabric playtime. 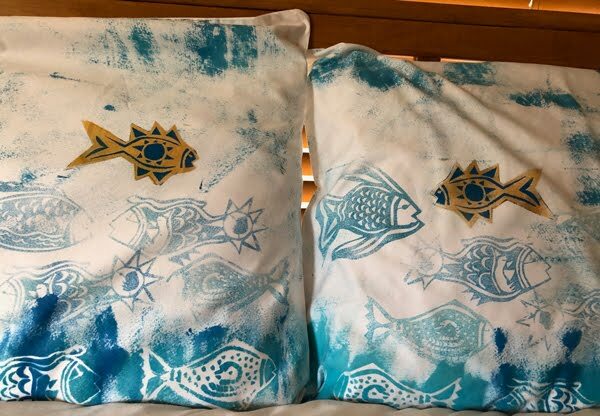 We just happened to need some new pillowcases for our AirBnB. 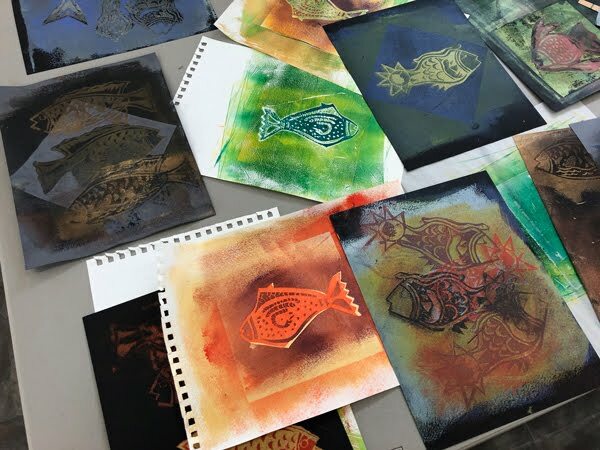 First I stenciled a school of fish across the bottom of the cases in compatible blue, blue-green and turquoise. I used a roller so I could get some texture happening in the background, in addition to the fish. 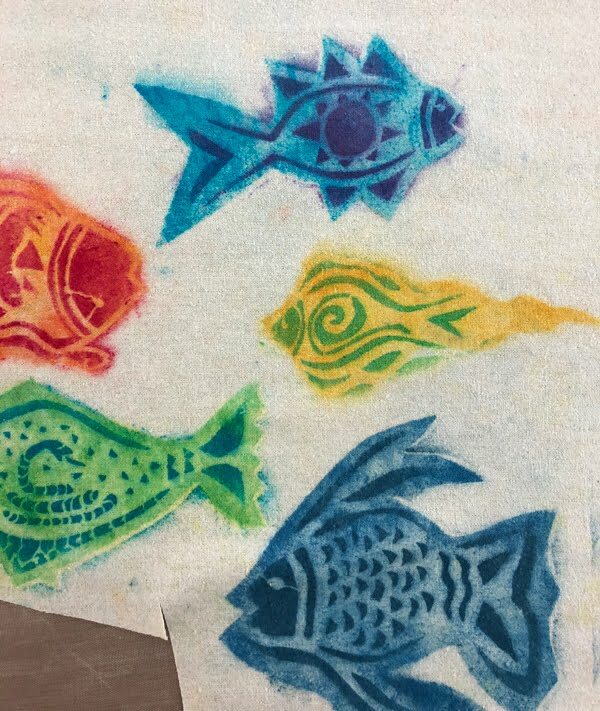 Then I used the fish, which were coated with paint, as stamps. It’s easy. 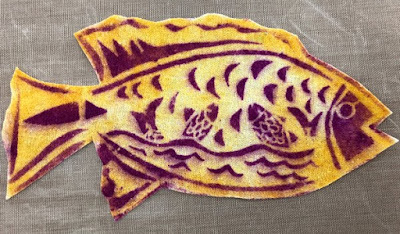 Put the paint coated fish on the cloth and cover it with an old washcloth so you can transfer the image to the cloth. 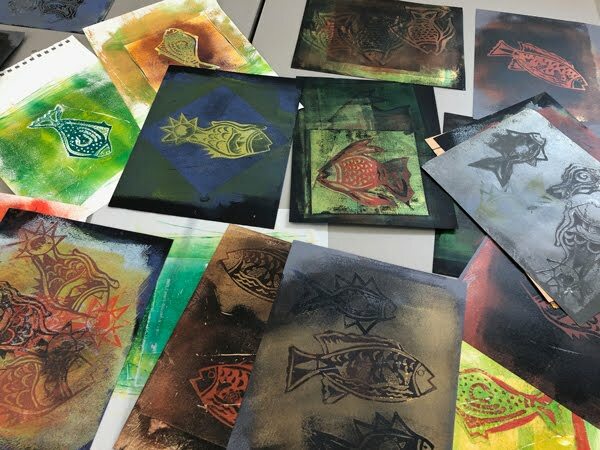 I built my school of fish using that technique. 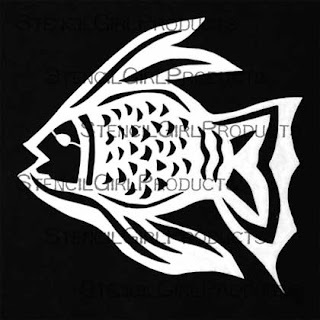 At the very end, I used one of the Dos Amigas fish masks along with the stencil itself, to add my focal point. 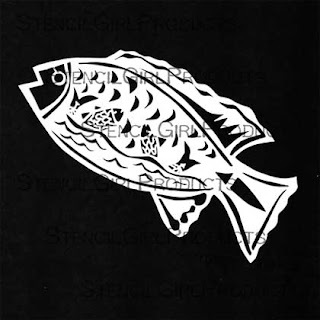 I used freezer paper to block out the area around the stencil so I could isolate the image and get it just right! Ideas were percolating now! I got out my soy wax MX dye pastes (available on my website, www.janedunnewold.com) and a length of silk noil. 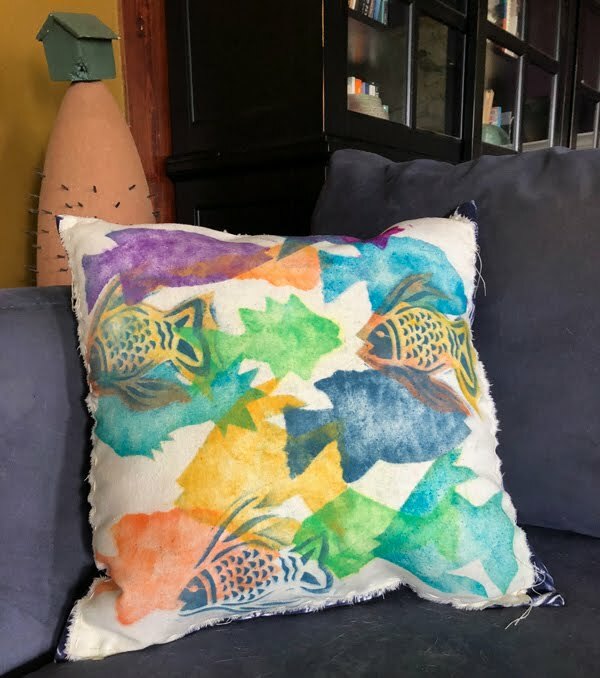 I stenciled dye paste onto the fabric, in bright colors, to honor the Mexican Story fish tradition. I did two versions. 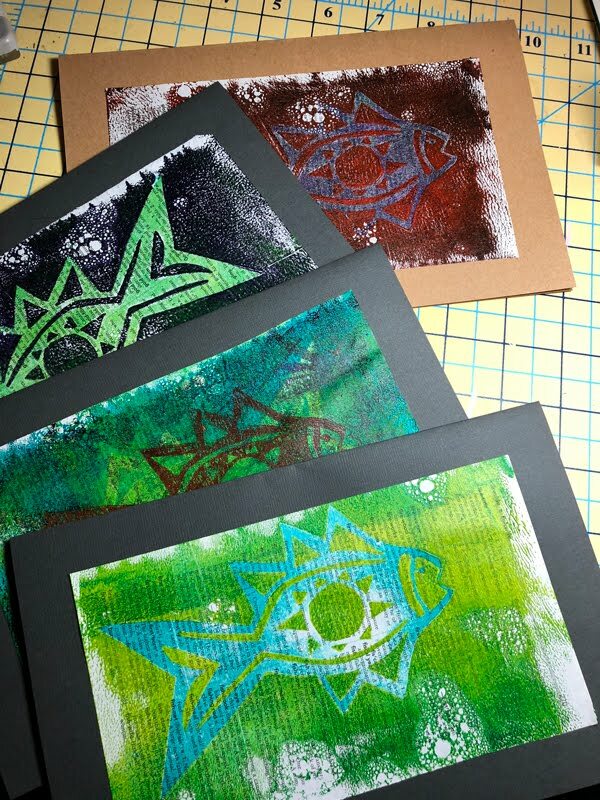 First I stenciled using the masks in one color, with the details applied in a second color. 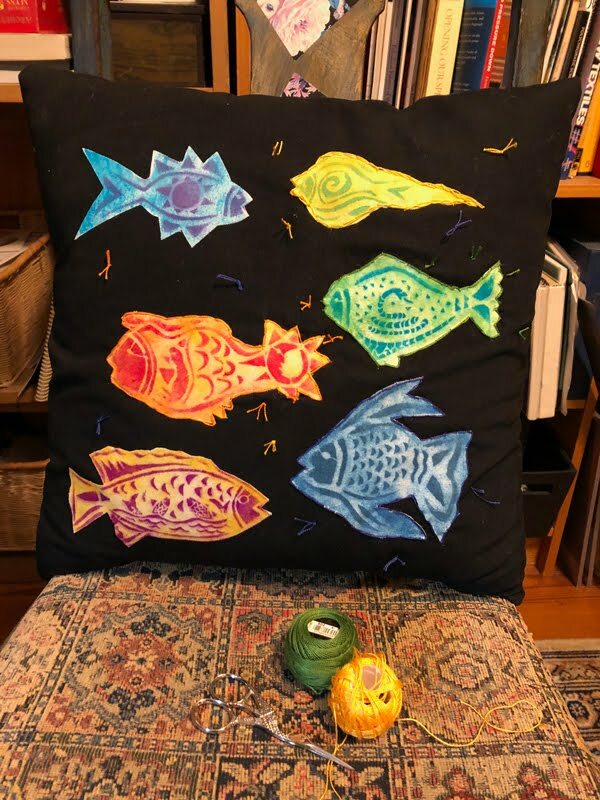 I planned to cut those out, and appliqué them to a black pillow, and then add a little embroidery, which worked out nicely. While I was working on my first version, it dawned on me that I could use the masks to create watery, transparent shadows. Whoa. This was exciting. As you can see, it worked out perfectly. I added my Angel Fish as the detail and popped it out from the shadows by using a dark navy blue dye paste. 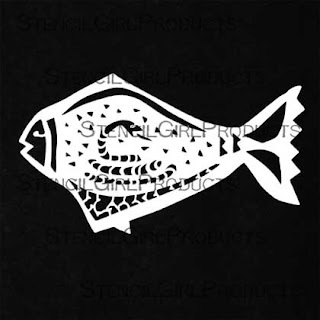 I know I’ve only scratched the surface when it comes to seeing what my new stencils will do. I hope you’ll jump in (the water’s fine!) and share a few of your own experiments! 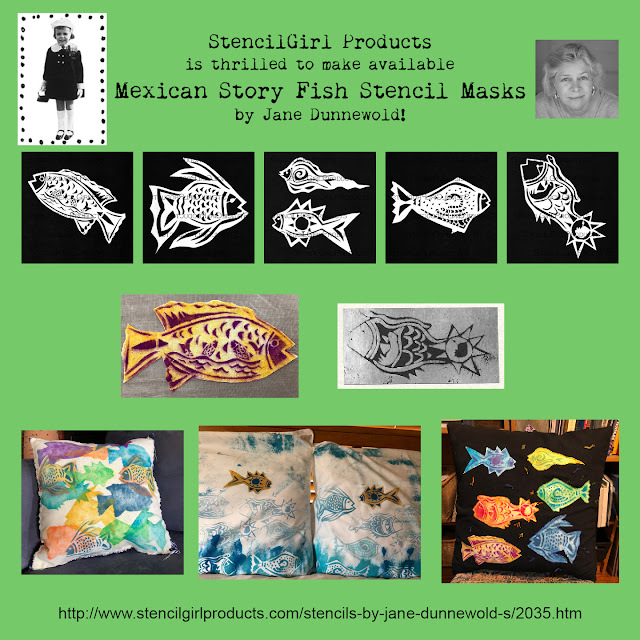 You can find all of Jane's stencils HERE. 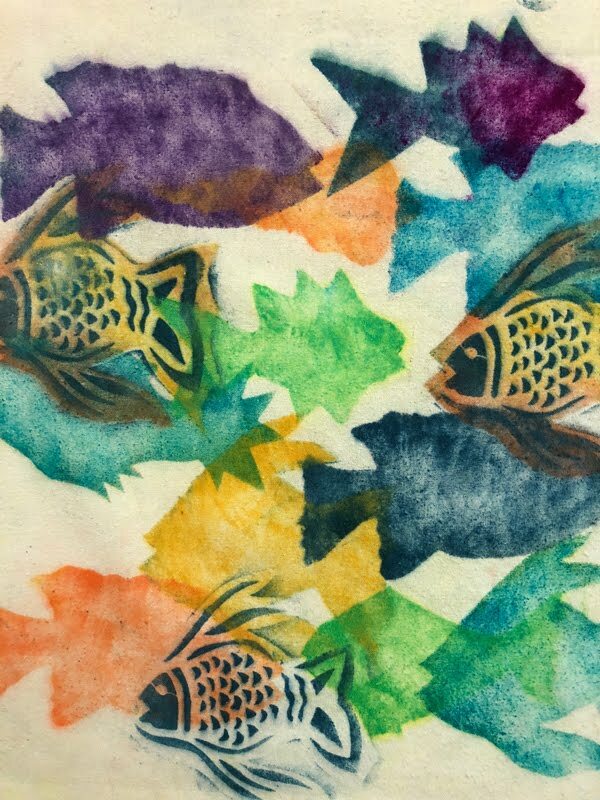 I LOVE the fish! 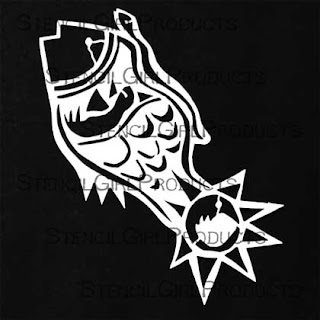 And all the ideas on how to use the stencils!